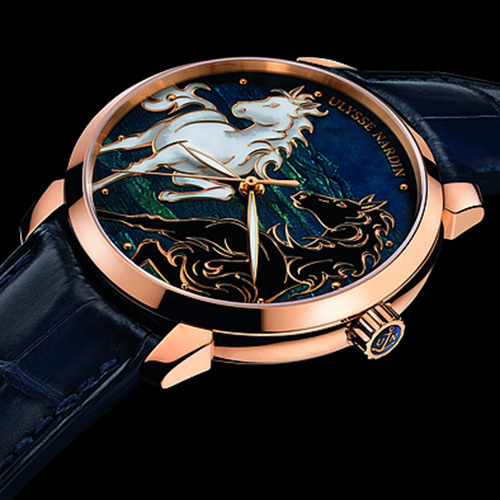 Ulysse Nardin Introduces 2014 with the Classico Horse. 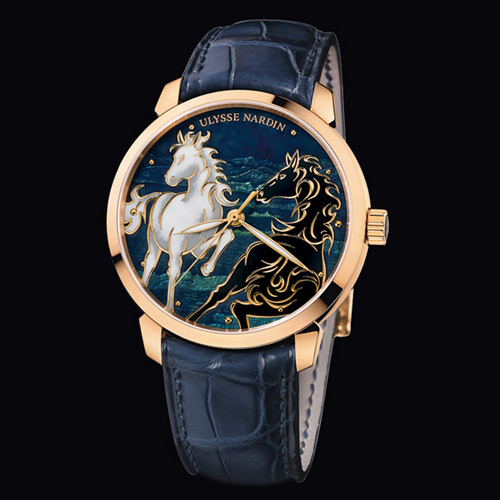 The Year of the Horse is upon us, and Ulysse Nardin pays tribute to the animal spirit with the Ulysse Nardin Classico Horse. Like the wild horses, it is a timepiece of independence made with the free-roamer in mind. Graceful with power, self-determined with emotion, and untamed with control, the horses on the watch’s dial appear to gallop with liberty. Expansive plains and majestic mountains in the background meet their arrival. 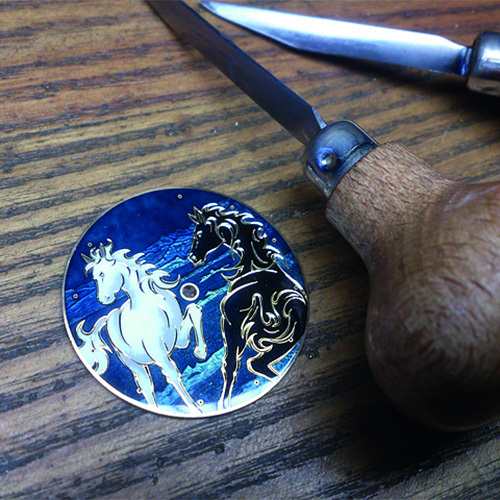 As with all Ulysse Nardin enamel pieces, the Classico Horse has an intriguing, lifelike quality. For more than 25 years, Ulysse Nardin has been bringing this realism to its dials through the rare art of enameling. Acquiring long-time collaborator and famed dial-enameller manufacturer Donzé Cadrans in 2011, Ulysse Nardin remains one of the only watchmakers devoted to this highly specialized, centuries-old craft. For the Classico Horse, Ulysse Nardin employs the intricate champlevé method where cells are carved with a chisel directly on the dial and filled with enamel. Its earth-tone palette of black, white, tan, gray and green is created from different metallic oxides, perfectly depicting the natural landscape and its small band of beautiful creatures. The piece is then fired until the enamel melts and is polished when the surface cools. The result: an exceptional creation produced by the hands of master artisans. A limited edition of 88 pieces in 18-karat rose gold, the Classico Horse 40mm features the self-winding UN-815 movement, visible through its sapphire crystal exhibition window located on the case back. The timepiece has a power reserve of approximately 42 hours and COSC-certified chronometer. The design of the Classico Horse charges forward with passion, as if symbolizing one’s personal drive through life. An emotional piece, it’s a symbol of one’s freewill balanced by self-discipline. Like Ulysse Nardin’s autonomy, it’s a timepiece for made for the independent-minded.